IPSC recognizes all the shooting disciplines - Handgun, Rifle, Shotgun, and Action Air. IPSC shooters need to blend accuracy, power, and speed into a winning combination. Multiple targets, moving targets, targets that react when hit, penalty targets, or even partially covered targets, obstacles, movement, competitive strategies, and other techniques are all a part of IPSC to keep shooters challenged and spectators engaged. SORS is a web application --- Shooting Organization and Registration System running on CMS Joomla. SORS provides the registration of clubs and competition shooters at the shooting matches (the IPSC rules). The SORS in itself allows you to manage three independent levels. 1. The first level is the status of the shooter. 2. The second level is the status of manager. 3. The third level is the highest level and has complete control over the entire system SORS. Levels of access rights S.O.R.S. The basic status of the shooter automatically reaches everyone who is into the SORS registers as a shooter (whether a member of the shooting club within shooting association, or a foreign guest or sponsor participating in activities related to the use of SORS). Sagittarius has the right (after registration) to modify their own user account, which contains information about the person (and data relevant to the needs Rifle Association and Chairman of the Club organizing their own shooting competitions) and may at any time according to their own needs change and adjust. Each shooter is assigned to the parent club in the relevant category I.P.S.C. Further to your user account can add (register) your weapons (for example, the need for registration in the race). The number of embedded weapons with unlimited shooter. 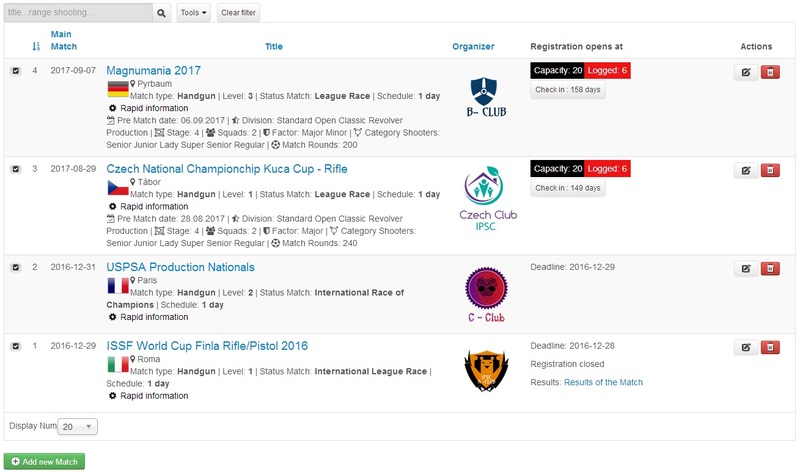 Subsequently, as a registered shooter in the system SORS can log on organized shooting competitions, without the need to fill out an application, or develop other activities related to logging in to the pretek.Organizátor race that has all the necessary information about you available immediately. On the race it is possible to sign up (or out) with one click in the appropriate Squad (you can choose a team where you want to shoot, for example, with his colleagues, who are in squad already signed in). The second level is the status of manager. Manager in the system SORS must first register as a shooter. The manager (usually the President of the club) is in addition to the status of bishop, assigned to the system status manager that entitles him to assign the system SORS own club (and publish all information about their own club) and to create, edit and evaluate shooting competitions. Each manager can edit and evaluate it only entered the race. Level two, assigns shooter administrator with rights (which may be a system administrator or members of the presidium) and therefore MANAGER status can not be obtained automatically. The third level is the highest level and has complete control over the entire system SORS. It assigns the highest officials of the shooting association who take complete control of everything he has SORS. For each intervention of SORS (for example, adjustments of the race one of the managers, editing user accounts shooters or information changes) are in the system kept accurate records. Level three, assigns administrator rights system administrator and status of third level can not be obtained automatically. All members of shooting associations who acquire the status of third level must first be registered with the system, with the status of the first level, ie with the status shooter. This obligation does not apply to people (administrators) who are not involved in activities Rifle Association, but provide IT services for the system SORS. Such people are registered only through system administration SORS. SORS Works with CMS Joomla! 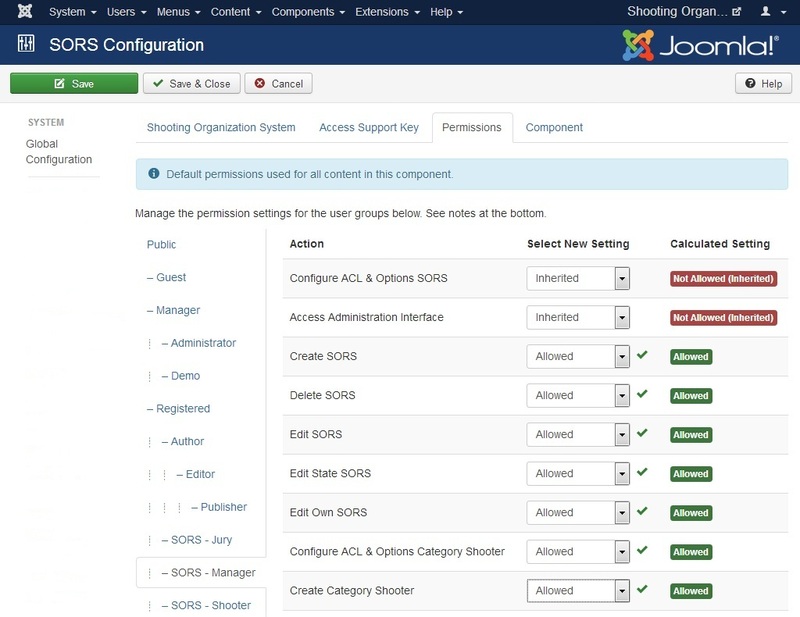 SORS version for Joomla! 3.7.x compatibility. Joomla! is a open-source content management system (CMS) for publishing web content. Basic package SORS Is designed for easy installation for a regular user. As a result, most people do not have problems installing and running software, and a broad support rate for beginners is available.